ENGLEWOOD — Tacarra Morgan, 6, was sitting on her family’s Englewood porch when the shots were fired. It was a warm July day and Tacarra was outside as her grandfather repaired her bike. She and her cousins liked to play on the sidewalk, her grandpa, Arther Morris, would say later, but for the moment his “little sweet pea” was sitting with her grandparents and mom. Morris ducked inside the home. Moments later, there was gunfire on the streets. The family ran inside and went into the basement. Morris, speaking a few days after the shooting, looked at Tacarra’s wound. Her flesh was “boiling out” on the side of her small body, he said, but she was calm. A video posted to Facebook showed what happened next: Police and onlookers gathered as a man held the quiet, bleeding girl. 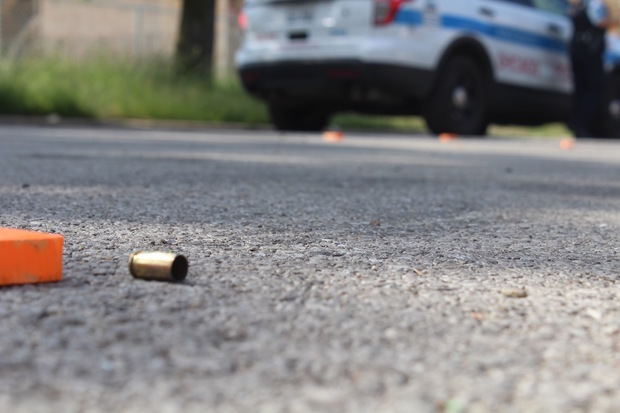 At least two dozen children 13 or younger have been shot this year in the city. Leo Betancourt, 13, was in a car when he was shot in his back and killed. On Father’s Day, 3-year-old Devon Quinn was with his dad when someone shot at their car. Devon survived but is paralyzed from the waist down. During one particularly violent stretch, four children — ages 11, 7, 5 and 4 — were shot within three days of each other. Even for those who survive, shootings have a lasting impact. The violence can lead to long-term mental and physical health problems for those wounded by gunfire and those who are only exposed to the violence. Tacarra, who survived the July shooting, is still scared, her mother said recently. She doesn't like the scars left by the bullet that tore through her side. The shootings and other forms of trauma are leading to a “public health crisis” among children, said Colleen Cicchetti, a supervisor at Lurie Children’s Hospital trauma treatment center for kids. Cicchetti’s team and others are working to train teachers, parents and others to look for signs of trauma in children, but she said only about 20 percent of kids who need mental health services nationwide are receiving them. Lurie’s clinic sees about 27,000 children a year — and it has a waiting list of 800 kids, she said. The list has doubled since last year, with some clinics and families telling Cicchetti the state budget crisis has led to funds being cut and clinics having to shut down. 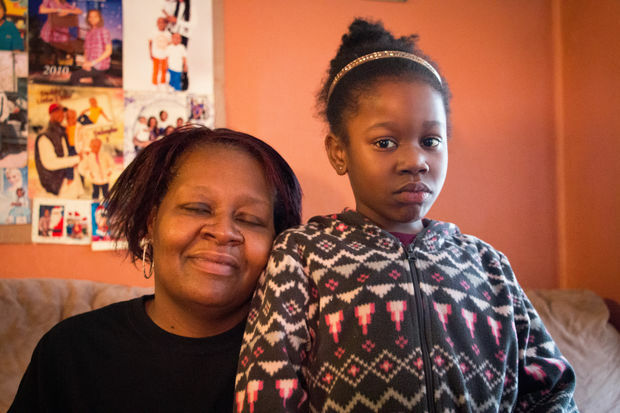 At Lurie’s, the growing demand means some children are having to wait for months to get help. Saying Chicago’s kids have post-traumatic stress disorder doesn’t paint the full picture, said James Garbarino, a psychology professor at Loyola University. He’s studied the effects of violence and trauma on Chicago’s children for decades. PTSD would mean children are living after — “post” — something traumatic happening. The children might have similar symptoms to PTSD, he said, like being afraid of gunfire, wetting their beds or having trouble sleeping, but many do not live "post" trauma. That trauma doesn’t only come in the form of gunfire. Trauma can come from living with poverty or experiencing racism, Garbarino said, or it can come as a result of abuse in the home, drug use and addiction and mental illness of parents. “If you drew a map of the affected kids [in Chicago], it would essentially be the same map as you would draw if you put a map on gang activity, murder rate, poverty,” Garbarino said. Those traumatic events accumulate, leading to development delays and mental illness in some, Garbarino said. It also leads to a vicious cycle: Children and teens don’t think police or parents can protect them, and they feel like they’re on their own, Garbarino said. That feeling pushes them even further into gangs they hope will protect them. “Every time a child is shot, other children know about it, and it undermines their sense of safety and security,” Garbarino said. Garbarino pointed to the 1992 shooting of Dantrell Davis as an example. Dantrell, 7, was walking to Jenner Elementary School with his mother. There were teachers on the steps of the schools and a police car on the street, Garbarino said. Dantrell’s mother let go of his hand, and the young boy began to walk the last 75 feet of the way to his school. In those 75 feet, Garbarino said, Dantrell was shot in his head and killed. In the decades Garbarino’s worked in Chicago, he’s noticed what he calls parallels between children in violence-plagued neighborhoods and children who live in war zones. During Lebanon’s civil war, he said, two-thirds of the children reported seeing someone being shot by the time they were 8 years old. Similar numbers — when you consider how many children have either heard shots or witnessed a shooting or its aftermath — are seen in some of Chicago’s neighborhoods, he said. There’s also a breakdown of adult authority in war zones and in Chicago’s troubled areas, Garbarino said, and when that happened in both areas children would realize they couldn’t be protected by adults and would look for other forms of protection. The diagnosis of PTSD was just as prominent in some war zones as in some of the city’s neighborhoods, Garbarino said. “In some war zones, kids believe there’s a social purpose and a social goal to the violence,” Garbarino said. “Whereas in Chicago neighborhoods that’s not true. There’s just crime. “We always thought that was one way that kids in a regular war zone were better off than kids in” some parts of Chicago, he said. While there are more resources to help kids than there were in the past, Garbarino said, there is still "less than is needed.” That's particularly true in poorer areas or communities of color, Garbarino said, even though those are the ones facing the most violence in Chicago. “If you’re a white, middle-class kid who has a traumatic experience, you’re still much more likely to get intervention than if you’re a poor black kid or [Latino] kid,” Garbarino said. At Lurie’s clinic, Cicchetti’s team works with kids who have been shot, but often they’re also working with children who have witnessed violence or lost family and friends, she said. The Center for Childhood Resilience works with children as young as 2 and as old as 18, Cicchetti said, though trauma also can affect infants. The care for each patient varies, but children and their families learn about what a normal response to trauma looks like, learn how to understand and work around the things that trigger them, identify what they're truly afraid of and talk about the traumatic events they've experienced. While some have to wait for services, those who need immediate care receive it, Cicchetti said. Trauma’s effects on Chicago’s kids isn’t just psychological, Cicchetti said. Some who live with trauma are in a constant “fight or flight” mode, Cicchetti said. For children, that can mean parts of their bodies — like their reproductive or immune systems — are “put on the back burner” and don’t develop properly. A national study, dubbed “ACE” since it looks at “adverse childhood experiences,” has found people who experience traumatic events in their childhood are more likely to face a wide array of mental and physical health problems the rest of their lives. They’ll be more likely to have a stroke or heart attack and more likely to face unemployment or take up smoking. According to the study’s results, people who have four or more adverse childhood experiences were 12 times as likely to commit suicide, Cicchetti said, and twice as likely to develop heart disease or cancer later in life. A similar study looked at a group of second-graders in Chicago. It used an expanded list of traumatic events, Cicchetti said, and found those children, on average, reported 11 traumatic events — with life-long consequences — by the time they reached second grade. Some children who experience trauma will be able to heal or cope without professional help if their families have the resources to create a “safety net” and provide “safe, stable, nurturing relationships,” Cicchetti said. “But when it’s this repeated and chronic, and nobody is dealing with that, you’re placed at greater risk,” Cicchetti said. Lurie’s clinic can’t directly help every child in the city, so it is training people who can go out and do that. It’s worked with Chicago Public Schools so teachers and other workers can identify signs of trauma in children and learn how to intervene to help an affected child, Cicchetti said. CPS also was recently awarded a nearly $1.3 million grant that will help students in neighborhoods with the most violence recover from traumatic experiences. Groups from all over the state are calling Lurie’s for training, Cicchetti said, and the clinic is working with the Illinois Child Trauma Coalition and the city’s Department of Public Health to address childhood trauma and train even more people to help kids. They’re even training people in other parts of the country, Cicchetti said. Others are taking a more individual approach to helping the city’s youngest shooting victims. Several days after Tacarra was shot, activists, neighbors and religious leaders gathered on her block. They spoke out against the shootings, held hands and prayed for God's help. "When we leave home, Father, in this war zone, we know not if we will make it back," one man said during a prayer. "But now we call upon you because you are able to save our babies, our little angels, our children, our little boys and girls, who are perishing at the hands of these ruthless criminals." Activists are also pushing for the city's leaders to invest in communities of color and create job and educational opportunities in areas hit hard by this year's surge in shootings and homicides. Daliah Goree, a Chicago Police officer for 19 years, was called to the July shooting of Tacarra. Goree’s worked in Englewood for most of her time on the force, and as she and her partner raced to the 6000 block of South Paulina Street — where Tacarra had been shot — the officer prayed. Goree had only been on the force two or three years when she was called to a similar shooting, and her mind went back to that night: A girl, 11 or 12 years old, had been inside her home sleeping. Shots were fired from outside the house. The home was smoky, Goree remembered. The girl’s mother was screaming. The child had been shot in her head. “That was my first incident with a child that had died,” Goree said. There would be more as the years passed. That night the officer went home and wept, thinking of the little girl who wouldn’t be able to go outside and play with her friends, have sleepovers or jump rope. Goree’s partner that day, Officer Eric Lee, would later go to the girl’s funeral. Goree never stopped thinking about that girl, she said. 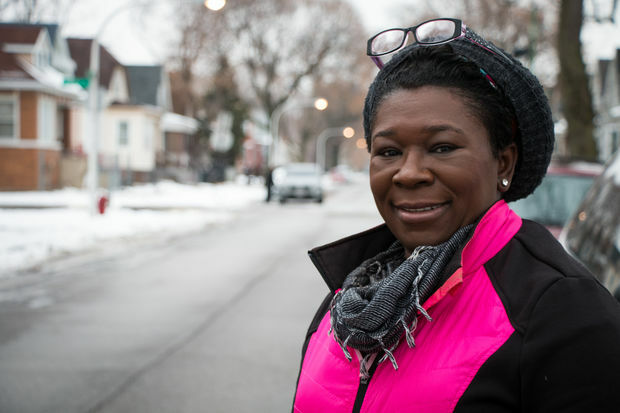 Raised by her family to help others, Goree became even more dedicated to helping Chicago's young people in her free time. Over the years, Goree helped mentor teens and kids through a youth fraternity, set up a father-daughter dance in Englewood, helped boys get into a youth basketball program and helped children go on trips or get computers for school. When she and her partner arrived on Tacarra's block that day, they saw the girl was alive, an uncle carrying her. Goree brought Tacarra to an ambulance and tried to calm the 6-year-old, asking questions — “What’s your name? What school you go to? How old are you?” — to keep her from going into shock. Tacarra was strong, Goree said. 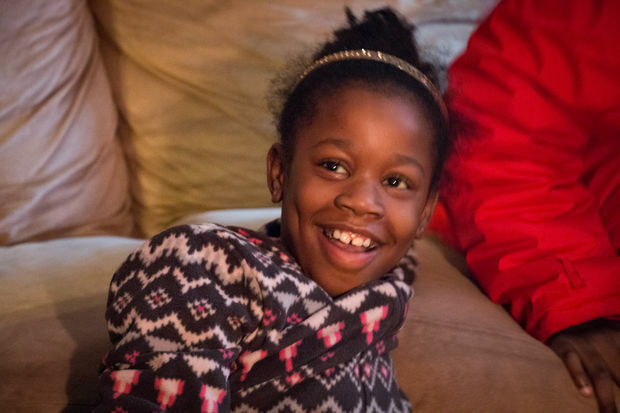 An ambulance took Tacarra and her mom to the hospital — the girl was in “critical but stable” condition, officials said a short time later — and Goree and her partner canvassed the area and looked for witnesses. Afterward, they went to the hospital and waited for news of Tacarra’s condition with the girl’s family. Goree prayed as Tacarra was in surgery, spoke to the family and worried, but she was still an officer. She sat down with her partner and worked. The officers were mostly quiet while they waited, Goree said, but they were also angry — angry a girl, a “baby,” her hair still in barrettes and ponytails, had been hit by gunfire just because she was sitting outside her home. Then someone from the hospital came up to the family. The surgery was a success. Tacarra was expected to live. Goree visited Tacarra in the hospital. When the 6-year-old was well enough to come home, police officers and community members banded together to throw a party complete with balloons, cake and decorations. Neighbors bought Tacarra a new bike. A few days later, officers brought an inflatable pool to the family's house. 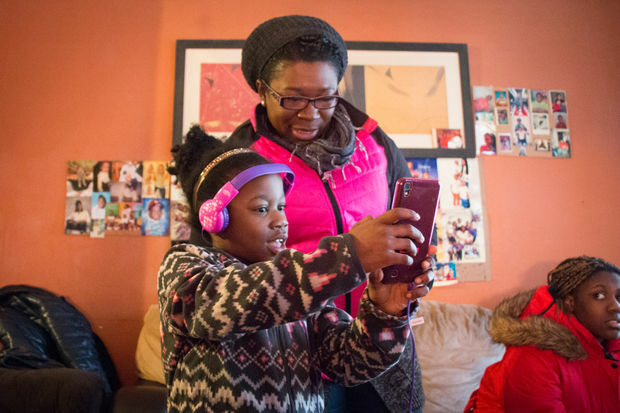 On Christmas Eve, Goree and a group of women and teen girls returned to Tacarra’s home with a carload of presents for the family. The girl was still "jumpy," her mom said the week before, and fears loud noises. But Tacarra opened her presents, putting them in a neat pile and then putting on a new pair of headphones. She plugged them into a phone, smiling but quiet as the music played. What was she listening to? Was she going to dance? the adults teased. Goree, trying to lure the young girl onto the floor, went to the center of the room and busted out her best moves. Tacarra sunk into the family room couch, grinning but still shy as Goree stepped back and the younger girls began to dance. "Come on, Tacarra!" everyone cried. They turned up the music louder. Tacarra threw them looks, unimpressed. And then a new song came on. The girls who had come with Goree danced together and sang. Tacarra stood and, as everyone cheered, threw out her arms and her legs and danced. She laughed. Later, when Goree and the others had to go, Tacarra walked up to each one and wrapped her arms around them.